nevard_110627_BQ_IMG_0286, a photo by nevardmedia on Flickr. Here's a punter's view of 'BQ' - Brewhouse Quay's all so trendy nickname, a bit like Baz, Caz, Tez is to hip 30 or 40 something Barrys, Carolines and Terrences. Though to be honest the abbreviated name probably has to do with where most of the raw materials came from! Some of the snaps of this tiny 4ft x 2ft layout tend to make the layout look rather big, I'm not sure why, but I guess getting the camera right in there and avoiding layout edges helps a lot. Good depth of field tends to rather buck the preconception that model photos should have a minimal focus - but I gather in contrast that there are photo-editing tools that will promise to make the real world look like a model by making large parts of the photo look out of focus. So, when you turn up to BQ's first outing at Model Rail Live in September, this is pretty well what will greet you, though you will have the addition of the Model Rail stand and various red clad members of the editorial team initially cursing what an awkward layout this is to operate with the high backdrop and 3 link couplings. Actually, with the little practice the layout is fun to operate, and there's plenty of scope to make up some kind of shunting puzzle too! I'll of course do my best to answer any questions - and if you're nice and don't smell too much you can have a go as well! sh1, a photo by nevardmedia on Flickr. Photo with persmission of M. Snellgrove. The other day I was uploading my old SDJR After Closure collection onto Flickr which used to exist on the now defunct Fotopic, and was charmed by this montage/panorama of two photographs taken at Shillingtone around 40 years ago just a few years after the rails were lifted If one had a time machine, I bet the chaps on the platform would never have believed that a generation and half later the derelict station they were standing on would be a hive of activity even sporting a brand new replacement signal box. This story is typical of many scenarios and even more extra ordinary when we think how much more red tape and cost is involved in getting what appear to be the simplest projects off the ground these days. Much of it I think has to do with a greater public awareness and wish to protect what links with history we still possess in the UK. I certainly remember as a child in the late 1960/70's that the general attitude was to chuck out anything old as we looked towards a sanitised modern society, all no doubt fuelled by the space race which was very big at the time. I recall that we all thought we'd be living on the moon, diving hover cars or at least wearing silver space suits whilst eating food pills by the millennium - scarily many of us looked forward to that at the time. How times have changed thankfully! See a bigger version of the above photo. 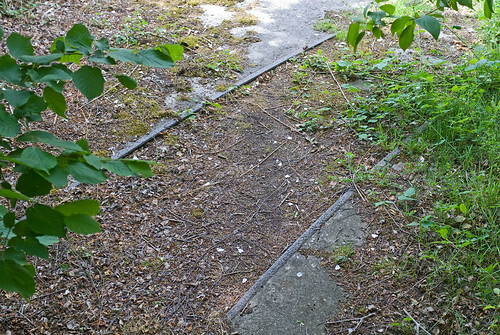 Visit the Shillingstone Station Project. nevard_110623_chertsey_DSC_2549_web, a photo by nevardmedia on Flickr. No. 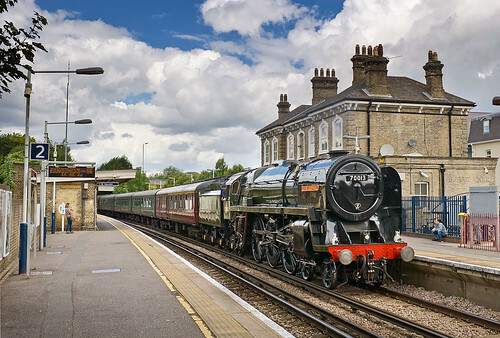 70013 Oliver Cromwell trundles through Chertsey with the London Victoria-Staines-Reading-Salisbury-Bristol and return 'Cathedral's Express', Thursday 23 June 2011. 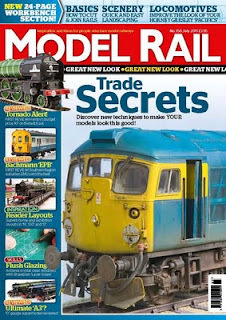 July 2011 Model Rail is out! The cover image is from the 'Workbench' section and champions Spencer Pollard's ground breaking weathering techniques. Whilst the subject is an O gauge 'Just Like the Real Thing' Class26, the methods described can be applied to almost any scale. Spencer is primarily a military modeller, and when I photographed the loco at last year's Warley Show, he said that this was his first attempt at a model railway loco! If the excellent results here are anything to go by, then military modellers ARE the ones to watch! 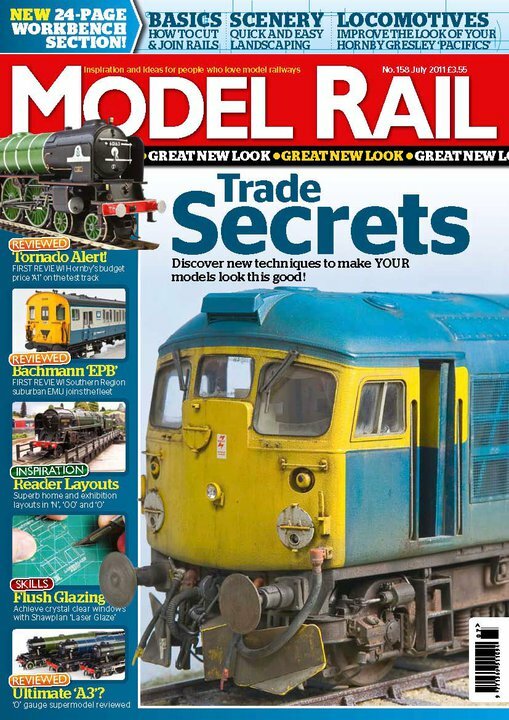 I'm hoping that we'll see more of Spencer's work in the pages of Model rail in due course. Regular followers of this blog will have noticed that I've not been posting much recently, however does not mean that I've not been enjoying the hobby, quite the opposite - for I've been literally burning the fuse at both ends providing photography and a couple of features for the next issue of Model Rail which is dedicated to my favourite railway in the form of a Somerset & Dorset Special! 'S&D Summer Saturdays' will be out on the 14th of July. Model Rail Sentinel on YOU TUBE! nevard_110601_writhington_DSC_2419_web, a photo by nevardmedia on Flickr. This is my first post for over a week, that's because we needed a well earned break. However whilst away, we all know that a train buff will never really switch off, especially when close to such a former rich industrial area like the hilly landscape a few miles south of Bath. For some time, I've been gathering information and constructing buildings for my Mendip Colliery project, so a spare hour of so in the Radstock area which was the centre of the North Somerset coalfield was far too tempting to miss out on. Lower Writhlington along with Kilmersdon were the last working collieries in the area closing in 1973, but less that 40 years has seen the latter disappear under housing and other brownfield redevelopments. However, a glance at Google Earth shows that apart from a private house, the site of the former Lower Writhlington colliery has yet to be developed.